Neil Jordan has been busy working in the land of TV for the past few years but he's returning to the big screen in 2019 with Greta. 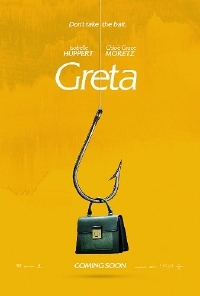 Co-written by Neil Jordan and Ray Wright (Pulse, The Crazies), the movie stars Isabelle Huppert as Greta, a distinguished widow who forget her bag on the subway. Chloë Grace Moretz is Frances, the good samaritan who finds the bad and returns it to Greta only to be talked into spending time with the lonely woman. But all good things must come to and end and here, the end is the discovery that Greta has "lost" her bag before and that she may not be as sad as she first appears. Grace also stars Maika Monroe, Colm Feore and Jordan regular Stephen Rea. I love a good thriller and though this one looks more than a tad melodramatic, I can't imagine skipping out on Huppert as an obsessed woman. If nothing else, it'll provide some entertaining meltdowns. Looks like it was filmed in Toronto &ndash; I think that's Lower Bay Station.